I first met Pierre (Golden Glow), and then later that night Laurie, on a trip to the UK in 2011 when the band THE NOTES had toured a bit in France and I played tour-dad. Before the guys headed back to Uni in Southampton and I returned home to the US, we traveled up to Manchester to meet up with Pierre. He and I had already begun planning the release of his debut album and this was a good time to meet face to face. We met for a pint, went to Piccadilly Records, had some more drinks, met up with Pierre’s friends that would eventually make up the live band for Golden Glow, and continued the party until there were no other places open in the city. Legendary night! 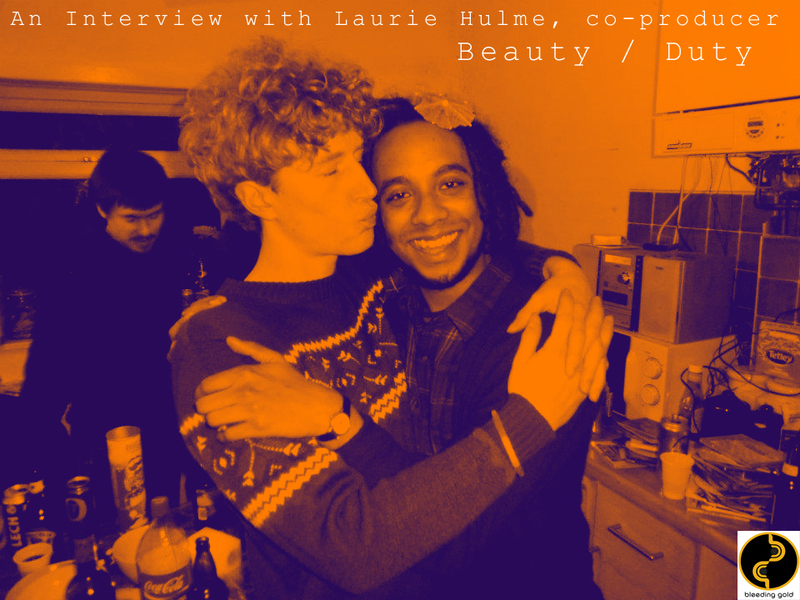 I asked Laurie Hulme (aka Songs For Walter) – co-producer of the new Golden Glow EP “Beauty/Duty” – to answer 4 questions about the making of the album. BleedingGold: How did you get involved with the recording of the EP? LaurieHulme: Obviously I really enjoyed playing in GG. Pierre writes great tunes and he allowed us all a certain amount of freedom to develop parts or play things subtly differently when we played live. Pierre records most of his stuff on his 4 track but he talked about wanting more control over the mix and with us practically living next door to each other it made sense to mix in my (very humble) home studio. BG: What is your favorite track and why? LH: Probably ‘The Scene.’ When we first played it live it was a lot faster. The version on here is so much dreamier, it has a kind of effortlessness to it and the Anna Karina vocal sample fits so well. BG: Knowing Pierre the little bit that i do, i’m assuming there were some crazy nights involved – care to share any stories of over-drinking, etc possibly related to the recording? LH: We probably spent ten times the amount of time talking about the fact we were gonna do this EP than it took to actually sit down and do it. We’d often mix for a bit and then head out into town. We had a practise room right in the middle of town which we’d often visit in the small hours after the bars had closed and play music at ridiculous volumes through the PA into the morning. I recall one morning when Pierre was so hungover he went to work wearing his slippers! BG: Your thoughts on Pierre’s move to London? LH: I think Pierre is really suited to London. I know he’s loving being in the thick of it already. He knew pretty much everyone in Manchester so I guess it’s very different for him being more anonymous down there, perhaps a lot more refreshing. This entry was posted on January 17, 2014 at 10:14 pm and is filed under Band Update with tags BG068, BGR, Golden Glow, interview, Laurie Hulme, Songs For Walter. You can follow any responses to this entry through the RSS 2.0 feed. You can leave a response, or trackback from your own site.